As part of a mid-February reset, Toys R Us stores near you most likely have their Diamond Select Toys Battle Beasts Minimates in stores now, marking the first time in roughly 25 years that those two words appeared on figure 2-packs in the USA. Each set is $7.49, and they are decorated differently than those sold to the comic book shops. Toys R Us also has an exclusive pair of beasts, pictured here. We've all waited a long time for this day, so good hunting this weekend Beast fans! As we've said in the past, there's an update: and that's that there is no update. As far as I could tell, Beast Saga was not on display in any form at New York Toy Fair. Hasbro didn't show it and nobody else seems to be importing it. 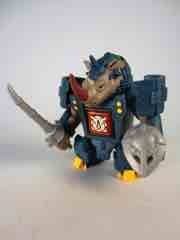 Diamond Select Toys' Battle Beasts line was nowhere to be seen inside Diamond's booth. I was told the line was not dead... just that there was nothing to show right now. There was an awful lot of Legends of Chima in standard LEGO minifigure scale plus larger, Bionicle-sized "constraction" kits. We'll be posting a gallery of a few dozen images over the next day or two. I just got home from New York as I type this and need to finish things up and go to bed after being up for almost a solid day. 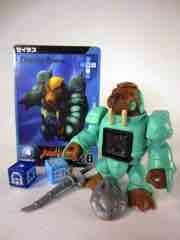 When I had initially pre-ordered Beast Saga figures in 2012, Seylas the walrus was pictured as a "blind box" figure. He didn't come in the blind boxes... clear guys did. I wasn't too thrilled about that. The original Wolfgang Walrus is one of my favorite toys and the new Gruntos toy (review to come) is a delight. As creatures go they're big, tubby, cold-loving, and mean. What's not to love? When seeing Rynas, it was pretty obvious he was going to be great. He is! He has big bulky armor, a huge head with a chunk of Rhino body sitting on his neck, and repurposed Bamet (the series 1 bird) weapons. He's hard not to like. The blood-red horn is an interesting touch, a rare whimsical coloration in an otherwise fairly realistic series of creature heads... which happen to be planted on anthropomorphic cyborg bodies.